If It's Hip, It's Here (Archives): What Most Of You Will NOT Be Sipping Tonight. The über Exclusive Angel Champagne. What Most Of You Will NOT Be Sipping Tonight. The über Exclusive Angel Champagne. So, what champagne will you be toasting with tonight to ring in the New Year? Dom Perignon? Cristal? Taittinger's? Perhaps a good sparkling wine or even sparkling apple cider. But odds are you won't be drinking Angel Champagne unless you're either very in the know, or personal friends with Mariah Carey. 12 years in the making, Stefano Zagni's recently released Angel Champagne is quite possibly the most exclusive on the market. The champagne, which is blended and cellared in Reims, France, is beautifully presented in stunningly designed, hand finished, numbered and signed bottles. "A passion for perfection is always paramount in my decision-making,” says founder Stefano Zagni, shown below. “Whether in business or my personal life." The story of Angel Champagne is testament to his passion. Throughout every stage of its refinement, care and expert judgment have been applied – in order that those fortunate enough to enjoy it know they are enjoying the very best. 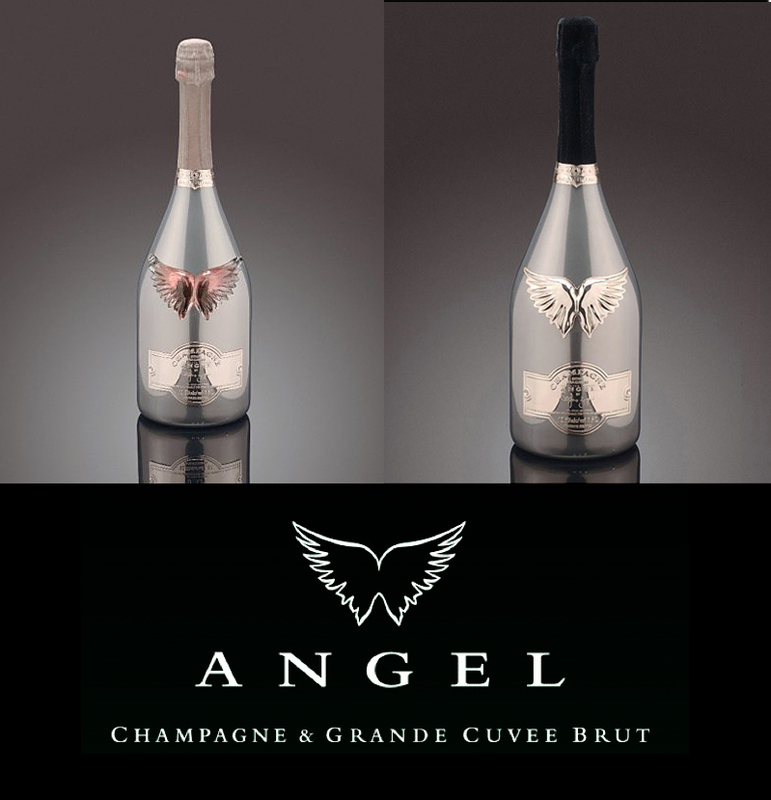 Angel Champagne is only available from the Angel web site or through specially selected establishments, which have been approved to stock the Angel range of Champagnes. The range of Angel Champagnes includes non-vintage, vintage and rosé champagne, made with grapes sourced from the very best and premier Crus from the region of Champagne where specialist blenders then apply the centuries-old craft of assemblage in order to perfect the unique Angel taste. 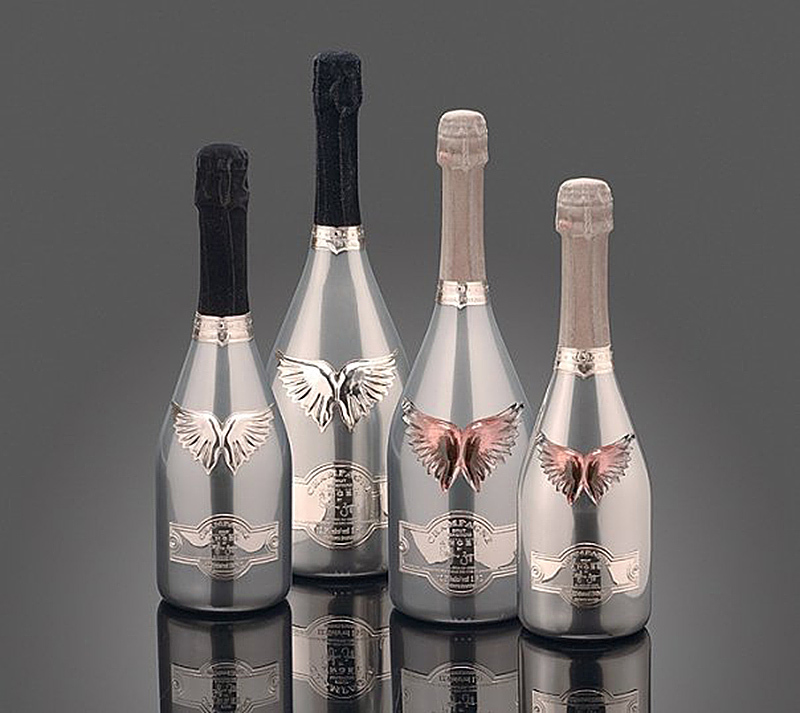 Then every bottle of Angel is hand-crafted and ‘finished’ with silver and cut-glass labels, inset gems and platinum finished body. Each hand-finished bottle is unique. 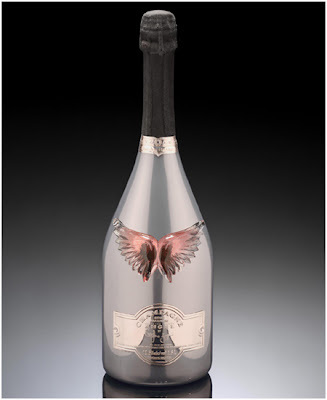 The iconic style of Angel and the hand finished detailing to the bottle known as ‘the body’ that contains the Champagne & Grande Cuvee Brut is unique to each Angel White and Angel Pink produced. The Angel White & Pink Magnum was specially selected for the sheer beauty and curve of the body and the pronounced shoulder & neck. No one bottle is the same with the Angel solid silver neck ring, identification label and stylised ‘Angel Mark’, hand finished with gems, produced and worked to be held for the first time. 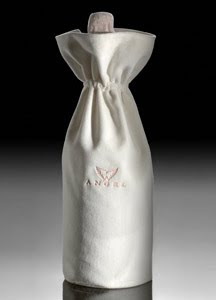 To mark the immensity of the new release, the very first 24 bottles of Angel Champagne will be set aside as items of special interest for discerning investors. Each of the 24 platinum finish bottles is to be individually numbered, with solid platinum label, hallmarking and mounted diamonds. 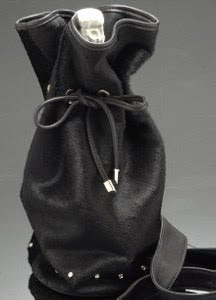 Each will be encased in the Angel handcrafted special creation leather tube with diamond-encrusted screw heads, silver base and head. These hugely collectible items will be available for £250,000 (or $401,863.78 USD). 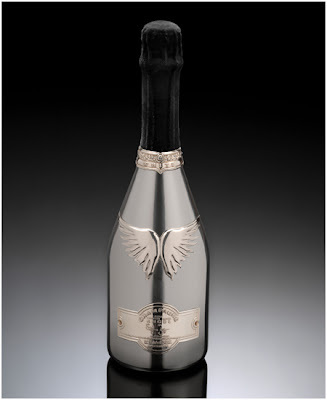 Platinum finish bottle body of immense stature with solid silver labels and neckband encrusted with diamond cut crystals and crystal cut glass wing embellishment and crowned with a unique silver speckled hand applied black flocked foil seal. 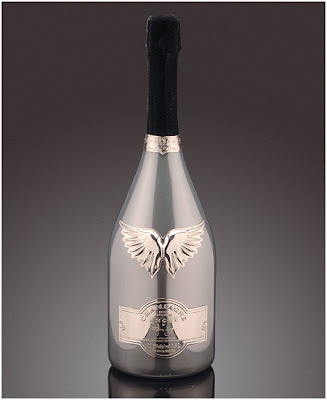 Platinum intense finish bottle body with solid silver labels and neckband encrusted with diamond cut crystals and crystal cut glass wing embellishment and crowned with a unique silver speckled hand applied black flocked foil seal. Platinum finish bottle body with crystal hand cut glass centre peice wing in a hint of pink, solid silver labels and neckband encrusted with diamond cut crystals and crystal cut glass wing embellishment and crowned with a unique silver speckled hand applied black flocked foil seal. 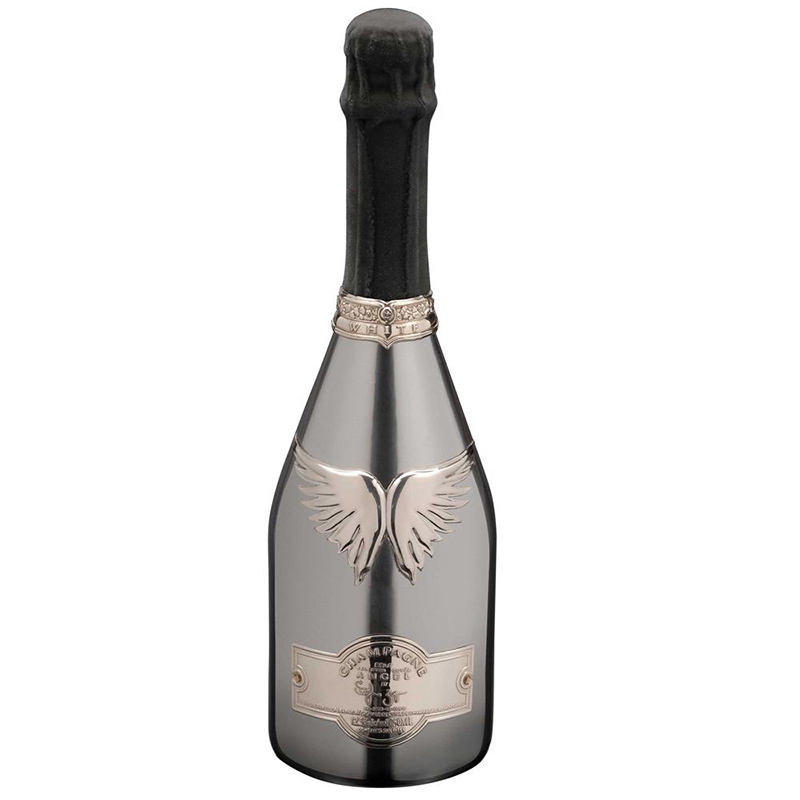 Platinum finish bottle body with solid silver labels and neckband encrusted with diamond cut crystals and crystal cut glass wing embellishment and crowned with a unique silver speckled hand applied black flocked foil seal. 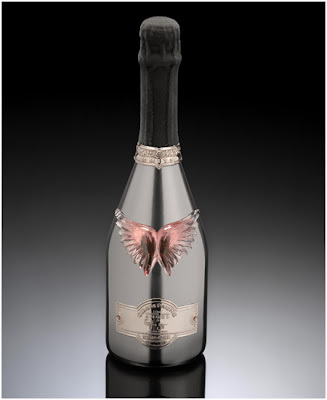 Platinum finish bottle body with crystal hand cut glass centre piece wing in a hint of pink, solid silver labels and neckband encrusted with diamond cut crystals and crystal cut glass wing embellishment and crowned with a unique silver speckled hand applied black flocked foil seal. 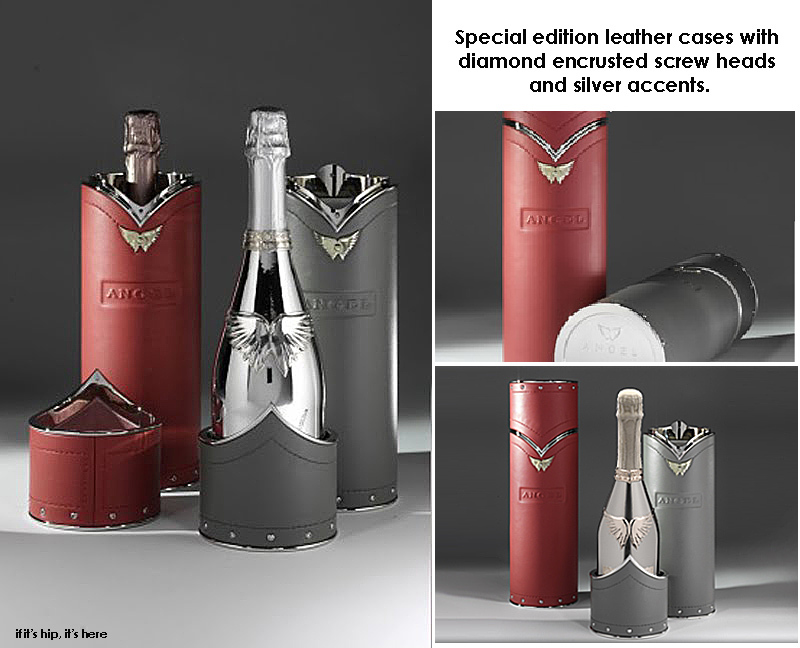 The Angel Special Creations range has so far included personalized, diamond encrusted bottles of Champagne and Champagne cases, plus beautiful leather bottle cases, which can be personalized, and hand finished to an exceptional and exacting level of quality. 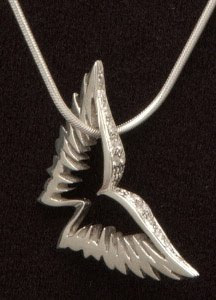 Not just the bubbly, Angel’s range of available accessories includes a lapel pin and cuff links for men, a bracelet, a ring, earrings, a hairpin and necklaces for women (some with diamonds), as well as unisex necklaces and cell phone charms. 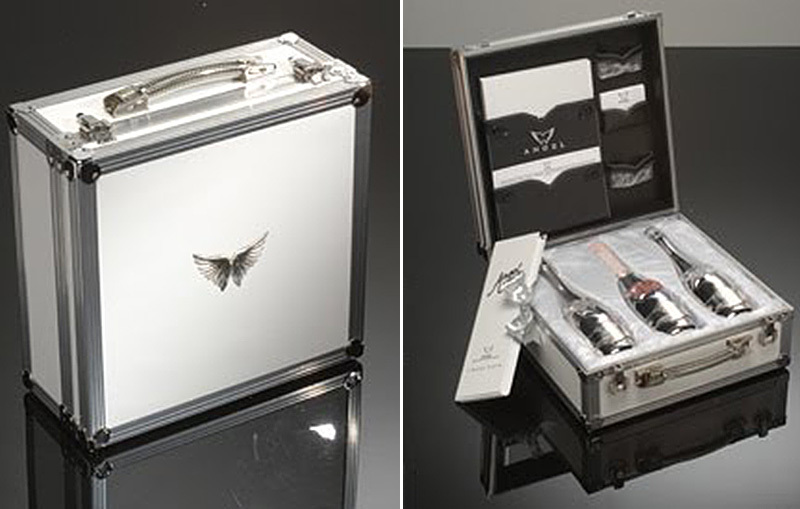 A specially tailored flight transit case is also available. All of which are shown below. Unlike luxury brand Roederer's Cristal champagne, who, in 2006, got a lot of grief (and a boycott by Jay-Z) for implying that they'd rather not be associated with hip-hop artists and their music videos, Angel champagne seems to be happy to take over that role. Given that Mariah is the 'face' of Angel Champagne, it's no surprise that the champagne was featured in her Obsessed video and is apparently one of the gifts she is known to send. Her album, "Memoirs of An Imperfect Angel" came bundled with a CD that featured advertising for products, including Angel Champagne. The champagne has also been featured in the Rick Ross video of the hit record ‘Magnificent’ and in Fabolous' Throw it in the Bag video. and their It's My Time video. Take that, Cristal. And Happy New Year! •Bevvy Of Buckets. 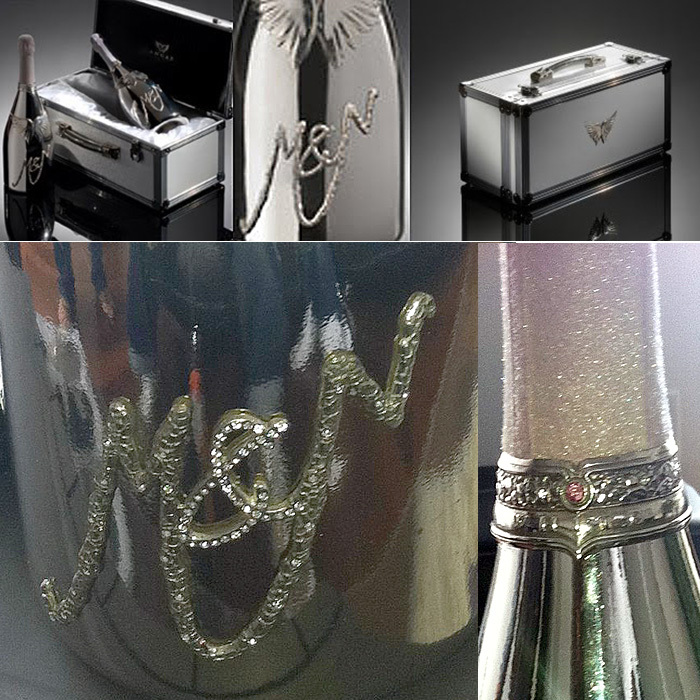 Modern Champagne Coolers And Ice Buckets. •More Bubbly For Your Buck. The Top 10 Best Champagne Deals. •Enough About Champagne To Make Your Head Spin. And That's Before You Drink It. Merry Christmas And Joy To The World. The Homies Are A Happening. Getting A Leg Up On Furniture Design With Habit.